Iran – Marivan, 1 November 2012. 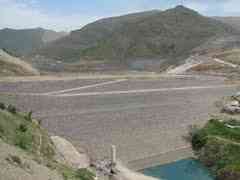 The Coordinating Committee to Help Form Workers’ Organizations has reported today that workers of the Jihad Development Company, the contractor responsible for the construction of the Banir Dam located near Negel in Marivan (North West Iran), have gone on strike again, protesting against not being paid their delayed wages. Workers employed by this contractor had gone on strike on 19 October 2012 to demand their delayed wages, and went back to work after the employer promised to pay all delayed wages within a week. Because this promise has not been fulfilled, workers of all sections, including heavy vehicle and ambulance drivers as well as the security personal, went on strike effective Tuesday 30 October 2012, and have announced that they will continue their strike until all their demands are met.